In a story sure to warm the cockles of longtime soccer fans in Canada, one of the greatest teams in Canadian history is being honoured. On Saturday June 6, the 1986 National Soccer team is being inducted into the Canadian Soccer Hall of Fame. 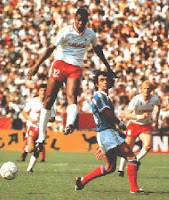 For those to young to remember the '86 team, it is known for being the only time that Canada qualified for the World Cup. Of course they never scored in their three games in Mexico. They may have hit a post in their losses to France, the Soviet Union and Hungary but this band of heroes made it to the big dance and Canadian soccer has never looked back. Well it hasn't actually gone forward either. I'm not sure what is more surprising in this story. Is it that a team that never scored is in a Hall of Fame? Howzabout that the only team to make the World Cup is being inducted into the Hall of Fame after 23 years? For me it's that Canada actually has a Hall of Fame for Soccer. A prerequisite for a "Hall of Fame" is the achievement of fame. Actually any achievement is a necessity to be honoured. Does the list of honorees include Pee Wee refs? If it wasn't for Maple Leaf Sports slapping down an MLS expansion fee to get a stadium construction contract, Canadian Soccer would still be a forgotten laughingstock. I wonder if the plaque honouring these heroes will include their participation in the 1986 Merlion Cup. After their scoreless exploits in Mexico, Canada was invited to participate in a exhibition tournament in Singapore. Going in as the favourites, Canada faced off against the hosts,China, North Korea, Indonesia and Malaysia. In a surprise, Canada finished third. It took a 10 month RCMP month investigation to discover that four Canadian players took bribes totaling $100000 to fix the games. While it merits a brief mention in the book"The Fix: Soccer and Organized Crime", the story is a forgotten footnote in the sorry tale of Canadian soccer achievement. It is actually one of the only times Canada was successful at soccer as the fix worked and the players avoided charges. So take a look a look at the plaque the next time you are in Woodbridge and are visiting the Soccer Hall of Fame. Just remember it is by appointment only. This can only give hope to Pete Rose and Barry Bonds who can rest assured that cheaters can make it into a Hall of Fame.